It has long been recognized by the medical community that seniors are at a higher risk of serious complications and hospitalization from the flu. Because immune defenses become weaker with age, this elderly age group contains the majority of deaths attributed to influenza. 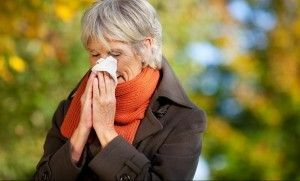 As we head into cold and flu season, it is important to boost your immune system and keep your aging loved ones healthy. Get a flu shot. The Center for Disease Control and Preventions recommends that you get a flu vaccine every year, especially if you are 65 years or older. The flu vaccine protects against the flu viruses that research indicates will be the most common in the upcoming season. Encourage your family and caregivers to get a flu shot. Encourage family and loved ones who will be in contact with the elderly to prevent the flu as well with a vaccine. Lay low this season. Taking extra precautions during the flu season, the frail should avoid large crowds and limit their exposure to others who may be ill. Visiting children. If an elderly parent lives with children in the household or grandchildren come to visit, parents need to be extra careful to make sure that their children wash their hands regularly. And if possible, avoid visits if the children are not well. Exercise regularly. Walking, golf, tennis, yoga and swimming are great ways to keep moving at any age and boost your immune system. Get plenty of sleep. It is recommended to get between 7-9 hours per night. During flu season, perhaps go to bed a little earlier to make sure that you are well-rested and stay healthy. Eat a balanced diet. Load your diet with plenty of fresh fruits and vegetables to get the necessary vitamins, nutrients, and fiber that you need to boost your immune system and guard against illness. Stay hydrated. During colder weather, many of us forget to drink water as often as we should. Drink plenty of water and healthy beverages throughout the day and avoid caffeine. Reduce your stress. Daily stress and tension can have detrimental effects on your immune system. Try to reduce your stress level and ask for assistance if you need it. Seek medical attention quickly. If you or your elderly loved one shows signs of the flu, seek medical advice quickly. Many medications for the flu must be administered with the first 48 hours after symptoms appear. Don’t wait. Whether they live alone, with your family or in a senior living community these tips will help to keep your parent healthy.